Lotus Notes NSF to PST Migration is required when user needs to migrate the data from Lotus Notes Email client to MS Outlook or Office 365 platform. IBM Lotus Notes and Microsoft Outlook both email clients use different file formats to store the whole data i.e. Outlook uses the PST file format and Lotus Notes uses the NSF file format. It is not possible to migrate the data from one email client to another without performing the conversion. In this article we will explain the different ways of converting NSF to PST format. And yes, many companies are still using Lotus Notes, so pay heed to these tips should you one day require the conversion. How to Perform NSF to PST Conversion Manually? Note: Don’t forget to take the backup of your NSF file before trying the steps mentioned below. Open the Lotus Notes email client and Open the NSF file that you need to convert in PST format. In case of Comma Separated Value you will get the dialog box given below, Select the options as shown in the image and click on OK button. If you have chosen the Structured Text then the dialog box you will get in given below, Select the Options as shown in the Image and click on OK bottom. From the Import and Export Wizard, select the option Import from another program or file and click on Next button. Now select the option Comma Separated Values and click on Next button. Browse the CSV file that we have created before and choose the appropriate option and press the Next button. In the Next step choose the destination folder where you want to import the NSF file and click on Next. This process may take some time and it depends on the size of your file. This manual process may sometime result in the data loss and hence a better and easy solution is required to perform the conversion. One such solution that performs the conversion with an ease is MailsDaddy NSF to PST Converter. Earlier I have used this tool to perform the migration task and it worked like a charm. It has quickly converted the data of my NSF file to PST file format. How to Perform NSF to PST Conversion using MailsDaddy NSF to PST Converter application? Click on Add File button to browse the NSF File. One of the best part of this tool is that you can convert multiple NSF file at a time, so browse the NSF files that you need to convert and press OK.
Also you can preview the content of NSF File. Click on Export button to perform the conversion of Lotus Notes NSF to Outlook PST format. From there choose the appropriate option, browse the destination path and click on Export button. That’s all! The software will perform the entire migration, you can check the progress from the progress bar. Now just open the Converted PST file in your Outlook email client to access the data in Outlook. 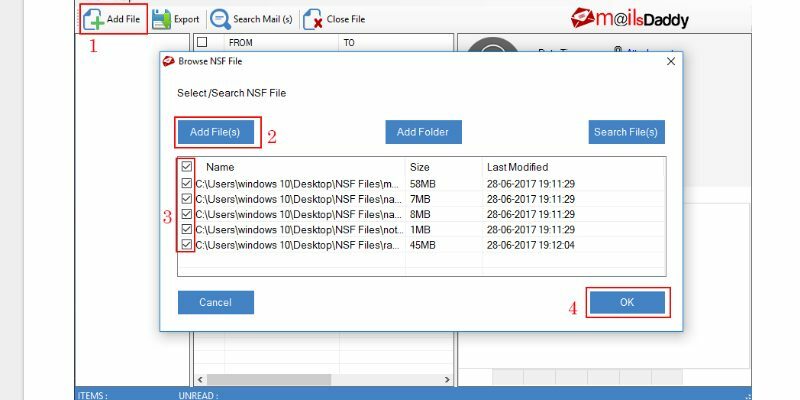 The software converts whole data of NSF file to PST format including Emails, Calendars, Contacts, notes to-do lists and journals etc. along with respective attachments. So this is the overall procedure of performing the NSF to PST Conversion. Because of the increasing demand and anywhere access facility of Office 365 some organizations are also planning to migrate their Lotus Notes data to Office 365 format. This is one of the complicated task. The manual method of doing the same may lead you in trouble if you don’t have enough technical skills. So let’s discuss both Manual as well other suitable solution of performing the same. The manual way of doing the same is MONTI which is quite complex. Another way to perform manual Lotus Notes to Office 365 Migration is by converting the NSF to PST format which is already described above and then uploading the data to Office 365 Account. The procedure of migrating data from PST to Office 365 is already described by FinancesOnline. First of all download and Install Lotus Notes to Office 365 Migration tool in your machine. Click on Add File button and browse the NSF files that you need to migrate to Office 365 account. Now click on Export button choose the appropriate option. In the next screen enter the office 365 credentials and click on Sign in button. That’s all! The software will perform the entire Lotus Notes to Office 365 Migration. In this article, we have discussed easiest way of migrating the data from NSF to PST format and from Lotus Notes to Office 365 account. Hope the above suggested steps are helpful for you. In case if you are facing any difficulty while going through the above steps then directly reach us. We will help you in performing the entire migration. Thanks a lot for your time in reading this article. On a related note, read our similar article on the best OST to Office 365 migration techniques.